The statement in the title is a folklore fact, though the term star discrete is usually not used whenever this well known fact is invoked in the literature. We present a proof to this well known fact. We also discuss some related concepts. All spaces are assumed to be Hausdorff and regular. First, let’s define the star notation. Let be a space. Let be a collection of subsets of . Let . Define to be the set . In other words, the set is simply the union of all elements of that contains points of the set . The set is also called the star of the set with respect to the collection . If , we use the notation instead of . The following is the well known result in question. Let be a space. For any open cover of , there exists a discrete subspace of such that . Furthermore, the set can be chosen in such a way that it is also a closed subset of the space . Any space that satisfies the condition in Lemma 1 is said to be a star discrete space. The proof shown below will work for any topological space. Hence every space is star discrete. We come across three references in which the lemma is stated or is used – Lemma IV.2.20 in page 135 of , page 137 of  and . The first two references do not use the term star discrete. Star discrete is mentioned in  since that paper focuses on star properties. This property that is present in every topological space is at heart a covering property. Here’s a rewording of the lemma that makes it look like a covering property. Let be a space. For any open cover of , there exists a discrete subspace of such that is a cover of . Furthermore, the set can be chosen in such a way that it is also a closed subset of the space . Lemma 1a is clearly identical to Lemma 1. However, Lemma 1a makes it extra clear that this is a covering property. For every open cover of a space, instead of finding a sub cover or an open refinement, we find a discrete subspace so that the stars of the points of the discrete subspace with respect to the given open cover also cover the space. Lemma 1a naturally leads to other star covering properties. For example, a space is said to be a star countable space if for any open cover of , there exists a countable subspace of such that is a cover of . A space is said to be a star Lindelof space if for any open cover of , there exists a Lindelof subspace of such that is a cover of . In general, for any topological property , a space is a star space if for any open cover of , there exists a subspace of with property such that is a cover of . It follows that every Lindelof space is a star countable space. It is also clear that every star countable space is a star Lindelof space. Lemma 1 or Lemma 1a, at first glance, may seem like a surprising result. However, one can argue that it is not a strong result at all since the property is possessed by every space. Indeed, the lemma has nothing to say about the size of the discrete set. It only says that there exists a star cover based on a discrete set for a given open cover. To derive more information about the given space, we may need to work with more information on the space in question. Consider spaces such that every discrete subspace is countable (such a space is said to have countable spread or a space of countable spread). Also consider spaces such that every closed and discrete subspace is countable (such a space is said to have countable extent or a space of countable extent). Any space that has countable spread is also a space that has countable extent for the simple reason that if every discrete subspace is countable, then every closed and discrete subspace is countable. Then it follows from Lemma 1 that any space that has countable extent is star countable. Any star countable space is obviously a star Lindelof space. The following diagram displays these relationships. 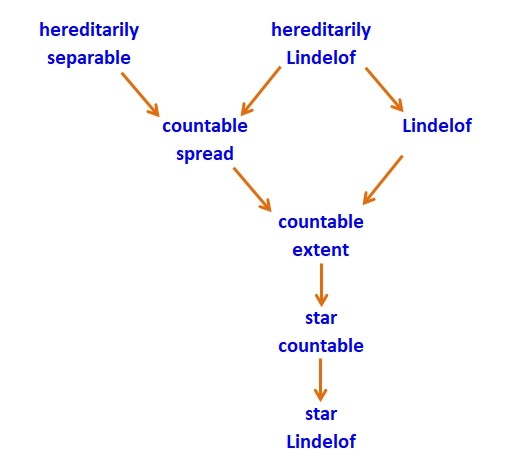 According to the diagram, the star countable and star Lindelof are both downstream from the countable spread property and the Lindelof property. The star properties being downstream from the Lindelof property is not surprising. What is interesting is that if a space has countable spread, then it is star countable and hence star Lindelof. Do “countable spread” and “Lindelof” relate to each other? Lindelof spaces do not have to have countable spread. The simplest example is the one-point compactification of an uncountable discrete space. More specifically, let be an uncountable discrete space. Let be a point not in . Then is a compact space (hence Lindelof) where is discrete and an open neighborhood of is of the form where is a finite subset of . The space is not of countable spread since is an uncountable discrete subspace. Does “countable spread” imply “Lindelof”? Is there a non-Lindelof space that has countable spread? It turns out that the answers are independent of ZFC. The next post has more details. We now give a proof to Lemma 1. Suppose that is an infinite space (if it is finite, the lemma is true since the space is Hausdorff). Let . Let be the next cardinal greater than . Let be an open cover of the space . Choose . We choose a sequence of points inductively. If , we can choose a point such that . We claim that the induction process must stop at some . In other words, at some , the star of the previous points must be the entire space and we run out of points to choose. Otherwise, we would have obtained a subset of with cardinality , a contradiction. Choose the least such that . Let . Then it can be verified that the set is a discrete subspace of and that is a closed subset of . Note that while for all . This follows from the way the points are chosen in the induction process. On the other hand, for any , for some . As discussed, the open set contains only one point of , namely . Alas O., Jumqueira L., van Mill J., Tkachuk V., Wilson R.On the extent of star countable spaces, Cent. Eur. J. Math., 9 (3), 603-615, 2011. Alster, K., Pol, R.,On function spaces of compact subspaces of -products of the real line, Fund. Math., 107, 35-46, 1980. Arkhangelskii, A. V.,Topological Function Spaces, Mathematics and Its Applications Series, Kluwer Academic Publishers, Dordrecht, 1992. A topological space is Lindelof if every open cover has a countable subcollection that also is a cover of . A topological space is hereditarily Lindelof if every subspace of , with respect to the subspace topology, is a Lindelof space. In this post, we prove a theorem that gives two equivalent conditions for the hereditarily Lindelof property. We consider the following theorem. Let be a topological space. The following conditions are equivalent. The space is a hereditarily Lindelof space. Every open subspace of is Lindelof. For every uncountable subspace of , there exists a point such that every open subset of containing contains uncountably many points of . This is an excellent exercise for the hereditarily Lindelof property and for transfinite induction (for one of the directions). The equivalence is the exercise 3.12.7(d) on page 224 of . The equivalence of the 3 conditions of Theorem 1 is mentioned on page 182 (chapter d-8) of . The direction is immediate. The direction is straightforward. We show . Suppose is a non-Lindelof subspace of . Let be an open cover of such that no countable subcollection of can cover . By a transfinite inductive process, choose a set of points and a collection of open sets such that for each , and . The inductive process is possible since no countable subcollection of can cover . Now let . Note that each can at most contain countably many points of , namely the points in . For each , let be an open subset of such that . We can now conclude: for every point of , there exists an open set containing such that contains only countably many points of . This is the negation of condition 3. Condition 3 indicates that every uncountable set has a certain special type of limit points. Let . We say is a limit point of the set if every open set containing contains a point of different from . Being a limit point of , we only know that each open set containing contain infinitely many points of (assuming a space). Thus the limit points indicated in condition 3 are a special type of limit points. According to the terminology of , if is a limit point of satisfying condition 3, then is said to be a condensation point of . According to Theorem 1, existence of condensation point in every uncountable set is a strong topological property (being equivalent to the hereditarily property). It is easy to see that of condition 3 holds, all but countably many points of any uncountable set is a condensation point of . In some situations, we may not need the full strength of condition 3. In such situations, the following corollary may be sufficient. If the space is hereditarily Lindelof, then every uncountable subspace of contains one of its limit points. As noted earlier, if every uncountable set contains one of its limits, then all but countably many points of any uncountable set are limit points. To contrast the hereditarily Lindelof property with the Lindelof property, consider the following theorem. If the space is Lindelof, then every uncountable subspace of has a limit point. The condition “every uncountable subspace of has a limit point” has another name. When a space satisfies this condition, it is said to have countable extent. The ideas in Corollary 2 and Theorem 3 are also discussed in this previous post. A short and quick description of the space is that is the one-point Lindelofication of an uncountable discrete space. As shown below, the function space is intimately related to a -product of copies of real lines. The results listed above are merely an introduction to this wonderful example and are derived by examining the -products of copies of real lines. Deep results about -product of real lines abound in the literature. The references listed at the end are a small sample. Example 3.2 in  is another interesting illustration of this example. open neighborhoods at the point are of the form where is countable. It is clear that is a Lindelof space. The Lindelof space is sometimes called the one-point Lindelofication of the discrete space since it is a Lindelof space that is obtained by adding one point to a discrete space. Consider the function space . See this post for general information on the pointwise convergence topology of for any completely regular space . All the facts about mentioned at the beginning follow from the fact that is homeomorphic to the -product of many copies of the real lines. Specifically, is homeomorphic to the following subspace of the product space . Thus understanding the function space is a matter of understanding a -product of copies of the real lines. First, we establish the homeomorphism and then discuss the properties of indicated above. For each , it is easily seen that there is a countable set such that for all . Let . Then each has non-zero values only on a countable subset of . Naturally, and are homeomorphic. We claim that is homeomorphic to . For each , define . Here, is the function such that for all . Clearly is well-defined and . It can be readily verified that is a one-to-one map from onto . It is not difficult to verify that both and are continuous. Thus . This completes the proof that is topologically the -product of many copies of the real lines. Understanding the function space is now reduced to the problem of understanding a -product of copies of the real lines. Most of the facts about -products that we need have already been proved in previous blog posts. In this previous post, it is established that the -product of separable metric spaces is collectionwise normal. Thus is collectionwise normal. The -product of spaces, each of which has at least two points, always contains a closed copy of with the ordered topology (see the lemma in this previous post). Thus contains a closed copy of and hence can never be paracompact (and thus not Lindelof). In this previous post, it is shown that is a Lindelof space. Though is not Lindelof, it has a dense Lindelof subspace, namely . A space is first countable if there exists a countable local base at each point . A space is a Frechet space (or is Frechet-Urysohn) if for each , if where , then there exists a sequence of points of such that the sequence converges to . Clearly, any first countable space is a Frechet space. The converse is not true (see Example 1 in this previous post). For any uncountable cardinal number , the product is not first countable. In fact, any dense subspace of is not first countable. In particular, the -product is not first countable. In this previous post, it is shown that the -product of first countable spaces is a Frechet space. Thus is a Frechet space. As a corollary of the previous point, cannot contain a homeomorphic copy of any space that is not Frechet. In particular, it cannot contain a copy of any compact space that is not Frechet. For example, the compact space is not embeddable in . The interest in compact subspaces of is that any compact space that is topologically embeddable in a -product of real lines is said to be Corson compact. Thus any Corson compact space is a Frechet space. where is such that and for each with . Note that is not closed and not discrete since the points in converge to where is the zero-function. Thus is not hereditarily normal. It is well known that collectionwise normal metacompact space is paracompact (see Theorem 5.3.3 in  where metacompact is referred to as weakly paracompact). Since is collectionwise normal and not paracompact, can never be metacompact. Bella, A., Masami, S., Tight points of Pixley-Roy hyperspaces, Topology Appl., 160, 2061-2068, 2013. Corson, H. H., Normality in subsets of product spaces, Amer. J. Math., 81, 785-796, 1959. In other words, the space is the subspace of the product space consisting of all points that deviate from the base point on at most countably many coordinates . We also consider the following subspace of . For convenience , we call the (upper case) Sigma-product (or -product) of the spaces and we call the space the (lower case) sigma-product (or -product). Clearly, the space is a dense subspace of . In a previous post, we show that the upper case Sigma-product of separable metric spaces is collectionwise normal. In this post, we show that the (lower case) sigma-product of separable metric spaces is Lindelof. Thus when each factor is a separable metric space with at least two points, the -product, though not Lindelof, has a dense Lindelof subspace. The (upper case) -product of separable metric spaces is a handy example of a non-Lindelof space that contains a dense Lindelof subspace. Clearly, . We prove the following theorem. The fact that is Lindelof will follow as a corollary. Understanding the following proof for Theorem 1 is a matter of keeping straight the notations involving standard basic open sets in the product space . We say is a standard basic open subset of the product space if is of the form such that each is an open subset of the factor space and for all but finitely many . The finite set of all such that is called the support of the open set . Let be the -product of the separable metrizable spaces . For each , let be defined as above. The product space is Lindelof for each non-negative integer and for all separable metric space . We prove by induction on . Note that , the base point. Clearly is Lindelof for all separable metric space . Suppose the theorem hold for the integer . We show that for all separable metric space . To this end, let be an open cover of where is a separable metric space. Without loss of generality, we assume that each element of is of the form where is a standard basic open subset of the product space and is an open subset of . Observe that for each point such that , the point already deviates from the base point on one coordinate, namely . Thus on the coordinates other than , the point can only deviates from on at most many coordinates. Thus is homeomorphic to . Note that is a separable metric space. By inductive hypothesis, is Lindelof. Thus there are countably many open sets in the open cover that covers points of . To see that the left-side is a subset of the right-side, let . If for some , we are done. Suppose for all . Observe that for some . Since , for some . Then . It is now clear that . Thus the above set equality is established. Thus one part of is covered by countably many open sets in while the other part is the union of countably many Lindelof subspaces. It follows that a countable subcollection of covers . If each factor space is a separable metric space, then each is a Lindelof space and that is a Lindelof space. If each factor space is a compact separable metric space, then each is a compact space and that is a -compact space. The first bullet point is a clear corollary of Theorem 1. A previous post shows that -product of compact spaces is countably compact. Thus is a countably compact space if each is compact. Note that each is a closed subset of and is thus countably compact. Being a Lindelof space, each is compact. It follows that is a -compact space. Now we put everything together to obtain the example described at the beginning. For each , let be a separable metric space with at least two points. Then the -product is collectionwise normal (see this previous post). According to the lemma in this previous post, the -product contains a closed copy of . Thus the -product is not Lindelof. It is clear that the -product is a dense subspace of . By Corollary 2, the -product is a Lindelof subspace of . Using specific factor spaces, if each with the usual topology, then is a non-Lindelof space with a dense Lindelof subspace. On the other hand, if each with the usual topology, then is a non-Lindelof space with a dense -compact subspace. Another example of a non-Lindelof space with a dense Lindelof subspace is given In this previous post (see Example 1). Let be an uncountable cardinal. Let be the Cartesian product of many copies of the real line. This product space is not normal since it contains as a closed subspace. However, there are dense subspaces of are normal. For example, the -product of copies of the real line is normal, i.e., the subspace of consisting of points which have at most countably many non-zero coordinates (see this post). In this post, we look for more normal spaces among the subspaces of that are function spaces. In particular, we look at spaces of continuous real-valued functions defined on a separable metrizable space, i.e., the function space where is a separable metrizable space. For definitions of basic open sets and other background information on the function space , see this previous post. All such properties stem from the fact that has a countable network whenever is a separable metrizable space. Let be a topological space. A collection of subsets of is said to be a network for if for each and for each open with , there exists some such that . A countable network is a network that has only countably many elements. The property of having a countable network is a very strong property, e.g., having all the properties listed above. For a basic discussion of this property, see this previous post and this previous post. There are only countably many sets of the form . Let be the collection of sets, each of which is the intersection of finitely many sets of the form . Then is a network for the function space . To see this, let where is a basic open set in where is finite and each is an open interval with rational endpoints. For each point , choose with such that . Clearly . It follows that . Examples include , and . All three can be considered subspaces of the product space where is the cardinality of the continuum. This is true for any separable metrizable . Note that any separable metrizable can be embedded in the product space . The product space has cardinality . Thus the cardinality of any separable metrizable space is at most continuum. So is the subspace of a product space of continuum many copies of the real lines, hence can be regarded as a subspace of . A space has countable extent if every closed and discrete subset of is countable. The -product of the separable metric spaces is a dense and normal subspace of the product space . The normal space has countable extent (hence collectionwise normal). The examples of discussed here are Lindelof and hence have countable extent. Many, though not all, dense normal subspaces of products of separable metric spaces have countable extent. For a dense normal subspace of a product of separable metric spaces, one interesting problem is to find out whether it has countable extent. The weakly Lindelof property is a natural weakening of the familiar Lindelof property. In this post, we discuss some of the basic properties of weakly Lindelof spaces. We consider topological spaces that are at least (i.e. finite sets are closed) and regular. A space is said to be Lindelof if for any open cover of , there is a countable such that . A natural weakening of the Lindelof property is that we only require the countable to cover a dense subset of the space . Specifically, a space is said to be a weakly Lindelof space if for any open cover of , there is a countable such that is dense in . The notion of weakly Lindelof has a brief mention in the Encyclopedia of General Topology (see page 183 in ), pointing out a connection to Banach space theory. Furthermore, assuming CH, the weakly Lindelof subspaces of are precisely those subspaces which are -embedded into . In this post, we focus on the basic properties. Clearly separable spaces and Lindelof spaces are weakly Lindelof. Another obvious property that implies weakly Lindelof is the existence of a dense Lindelof subspace. It is slightly less obvious that the countable chain condition implies the weakly Lindelof property. We have the following implications. All the affirmative implications in the above diagram cannot be reversed (see Examples 1, 2 and 3 below). Some of the properties discussed below can be described by cardinal functions, e.g., Lindelof number and weak Lindelof numbers. So we describe these before going into the basic properties. Let be a space. The Lindelof number of the space , denoted by , is the least cardinal number such that every open cover of has a subcollection with such that is a cover of . When , we say that the space is Lindelof. The weak Lindelof number of the space , denoted by , is the least cardinal number such that every open cover of has a subcollection with such that . When , we say that the space is weakly Lindelof. The character at , denoted by , is the least cardinal number of a local base at the point . The character of the space , denoted by , is the supremum of all the cardinal numbers over all . When , we say that is first countable. The cellularity of the space , denoted by , is the least infinite cardinal number such that every collection of pairwise disjoint non-empty open subsets of has cardinality . When , we say that has the countable chain condition. The extent of the space , denoted by , is the least infinite cardinal number such that if is a closed and discrete subset of , then . If , then is said to have countable extent (there are no uncountable closed and discrete subset). It is well known that Lindelof spaces have countable extent. The Lindelof number and the extent is related by the inequality: . Weakly Lindelof spaces behave differently from Lindelof spaces in some ways. For example, closed subsets of a weakly Lindelof space do not have to be weakly Lindelof. In other ways, weakly Lindelof spaces and Lindelof spaces behave similarly. For example, the product of weakly Lindelof spaces needs not be weakly Lindelof and that every continuous image of a weakly Lindelof space is weakly Lindelof. Any Lindelof, Hausdorff and first countable space has cardinality no more than continuum. There is a similar theorem for weakly Lindelof spaces. Despite all these similarities with Lindelof spaces, the weak Lindelof property is a very weak property. It is well known that every Lindelof space has countable extent. There is no bound on the extent of weakly Lindelof spaces. The extent of a weakly Lindelof space can be arbitrarily large (see Example 4 below). We discuss the following properties of weakly Lindelof spaces. Any space with the countable chain condition is weakly Lindelof. Any paracompact weakly Lindelof space is Lindelof. Every continuous image of a weakly Lindelof space is weakly Lindelof. The product of a compact space and a weakly lindelof space is weakly Lindelof. The product of two Lindelof spaces needs not be weakly Lindelof. Any normal first countable weakly Lindelof space has cardinality . For any infinite cardinal , there exists a weakly Lindelof space such that , i.e., the extent is at least . See Example 4 below. A space has the countable chain condition (has the CCC or is CCC for short) if there exists no uncountable collection of non-empty pairwise disjoint open subsets of . “CCC weakly Lindelof” follows from the following theorem (proved in this previous post). A space has the CCC if and only if for every collection of non-empty open subsets of , there is a countable such that . To finish off, let be an open cover of . By the theorem, there exists a countable such that . This means that . Even though CCC implies weakly Lindelof, CCC does not imply the stronger property of having a dense Lindelof subspace (see Example 3 below). The proof of 1 can be generalized to show that for any space . However, the inequality cannot be made an equality. In fact, the inequality can be made as wide as one wishes. Specifically, we can keep while making as large as one wishes (see Example 2 below). Thus the notions of countable chain condition and the weakly Lindelof property are far apart. Let be an open cover of a paracompact weakly Lindelof space . Using the regularity of the space, there is an open refinement of for each , for some . Using the paracompactness, let be a locally finite open refinement of . Using the weakly Lindelof property, choose a countable such that . With the collection being locally finite, we have . Thus every point of belongs to some for some . Tracing from to , to and then to , we see that for every , for some . It follows that a countable subcollection of is a cover of . This completes the proof of bullet point 2. This result implies that in any metrizable space, the weakly Lindelof number coincides with the Lindelof number. So in metrizable spaces, the weak Lindelof number is just as good as an indicator of weight as the other cardinal functions such as density and Lindelof number. Among CCC spaces, paracompactness and the Lindelof property coincide. This result shows that among weakly Lindelof spaces, paracompactness and the Lindelof property also coincide. The proof of 3 is straightforward. It is very similar to the proof that continuous image of a Lindelof space is Lindelof. The proof that the product of a compact space and a weakly Lindelof space is weakly Lindelof makes use of the tube lemma, as in the proof that the product of a compact space and a Lindelof space is Lindelof. Let be weakly Lindelof. Let be compact. Let be an open cover of . For each , let be finite such that is a cover of . By the tube lemma, there exists some open set such that . Since is weakly Lindelof, there exists a countable such that . Let . It is clear that is a countable subcollection of . Note that the set is dense in . Thus the set is dense in too. Thus . This completes the proof that is weakly Lindelof. An example of two Lindelof spaces whose product is not weakly Lindelof is provided in . for any normal space (Theorem 2.1 in ). Thus the cardinality of any normal weakly Lindelof space is bounded by . One-point Lindelofication of an uncountable set. The space is denoted by and is the set where is the discrete space of cardinality and is a point not in . The open neighborhoods at have the form where is countable. The space with the order topology. Note that is the immediate successor of , the first uncountable ordinal. See here. The unit square with the lexicographic order. See here. The Alexandroff Double Circle. See here. In the above four spaces, the first one is Lindelof and the other three are compact. All four do not have the countable chain condition. A non-Lindelof space that has a dense Lindelof subspace. As a bonus, this space does not have the CCC. The idea is to start with a space that has a countable dense set of isolated points and an uncountable closed and discrete subset. One such space is a so called psi-space, a space defined using an uncountable almost disjoint family of subsets of . Then replace each of the countably many isolated points with a copy of one of the above examples of a Lindelof space without the CCC. Let the first infinite ordinal (or the set of all nonnegative integers). Let be an uncountable almost disjoint family of subsets of (for the purpose of this example, it does not have to be an maximal almost disjoint family). Let , where each is isolated and each has open neighborhoods of the form where is finite. For a more detailed discussion about Psi-space, see this previous post. where is finite. The union of all is a dense Lindelof subspace of . The set is an uncountable closed and discrete subset of . Thus is not Lindelof. Each has uncountably many disjoint open sets. Thus does not have the CCC. This example shows that the existence of a dense Lindelof subspace implies neither the CCC nor the Lindelof property. A weakly Lindelof non-CCC space . Let be any one of the above three non-CCC compact spaces. Let be any space with the CCC, hence is weakly Lindelof. Let . Then is weakly Lindelof. It is also clear that does not have the CCC. This example shows that the weakly Lindelof property does not imply the countable chain condition. This example shows that . In fact, it is possible to make as large as possible. In the definition of in this example, let be the one-point Lindelofication and be any CCC space. Then can be made as large as possible. Hence can be made as large as possible. A CCC space that has no dense Lindelof subspace. This example is found in a paper of Arhangel’skii (Theorem 1.1 in ). Let be the set of all continuous real-valued functions defined on . The set endowed with the pointwise convergence topology is typically denoted by . The space we want to use is . The space is a dense subspace of the product space . Thus has the CCC. In , it is shown that does not contain a dense normal subspace. Hence it does not contain a dense Lindelof subspace. The proof that does not contain a dense normal subspace is a deep and non-trivial result. The example shows that even though CCC implies the weakly Lindelof property, it cannot give the stronger property of the existence of a dense Lindelof subspace. It is also an example showing that the implication “existence of a dense Lindelof subspace weakly Lindelof” cannot be reversed. An weakly Lindelof space such that the extent can be made arbitrarily large. Note that is a -compact dense subspace of . Hence is weakly Lindelof. On the other hand, the set is a closed and discrete subset of . Since the cardinality of can be made arbitrarily large, the extent of can be made arbitrarily large. Thus there is no upper bound on the extent of weakly Lindelof spaces (unlike Lindelof spaces). Arhangel’skii A. V., Normality and Dense Subspaces, Proc. Amer. Math. Soc., 48, no. 2, 283-291, 2001. Bell M., Ginsburg J., Woods G., Cardinal Inequalities for Topological Spaces Involving the Weak Lindelof Number, Pacific J. Math., 79, no. 1, 37-45, 1978. Hajnal A., Juhasz I., On the Products of Weakly Lindelof Spaces, Proc. Amer. Math. Soc., 130, no. 1, 454-456, 1975.